The tuner chips using the RTL2832U dongles have a limited frequency range. The characteristics of the used tuners (Elonics E4000, Rafael Micro R820T, Fitipower FC0013, etc.) can be found on the Osmocom list. These chips, depending on the model, can receive signals in the range from 22 MHz up to 1.766 MHz which leads to the attempt to extend the range into the lower and higher frequencies. 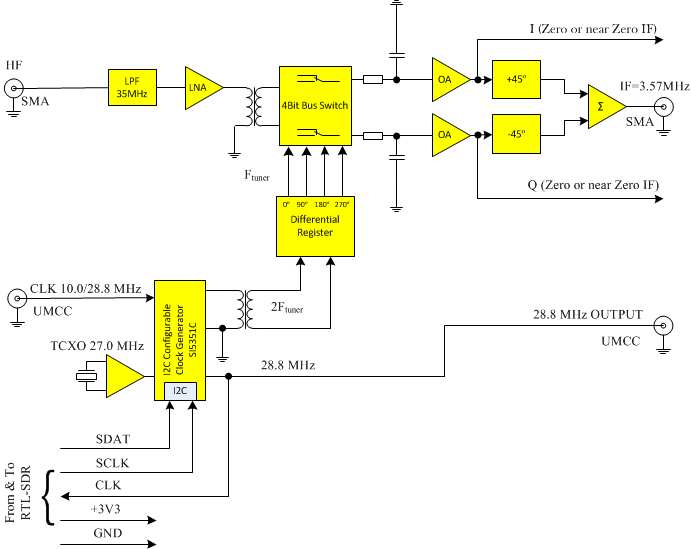 Direct sampling mode: 28.8 MHz RTL2832U’s ADC is used for RF sampling. Upconverter: An upconverter works simply by shifting the frequencies below 30 MHz up to a higher frequency that the R820T-tuner can receive: For example, a 5 MHz signal might be upconverted to 105 MHz. Both above mentioned solutions are relative cheap but have their disadvantages (see this thread for more information). There are many different HF UpConverters for the RTL2832U receiver available on the market https://retrovoltage.com/2012/09/14/round-up-of-rtlsdr-upconverter-choices/. Most of them have the same design: input filter for low-frequencies (LPF) with cutoff frequency 33..40 MHz, active (e.g. SA612) or passive (e.g. ADE-1) mixer, local oscillator at a fixed frequency from 50 MHz up to 120 MHz. Sometimes, the input LNA is used to improve sensitivity. The transfer of the wide spectrum range into the range that can be received by the dongle is not ideal and leads to the undesired combination of frequencies and intermodulation interferences. Eliminating these undesired mixed products necessitates the use of additional filters for filtering out higher harmonics, frequency suppressing of the oscillator using the notch filter and applying some additional circuit solutions, as described in the article by Klaus Warsow: “Breitbandempfänger von VLF bis UHF mit modernem DVB-T-Stick”, Funk Amateur, №5, 2014, p.500. bandwidth not less than 30 MHz. high linearity amplitude-frequency and phase characteristics are necessary. Otherwise, there is the appearance of intermodulation interference from strong radio stations or stable operation is affected (excitation). The latter is especially relevant to the active upconverters. 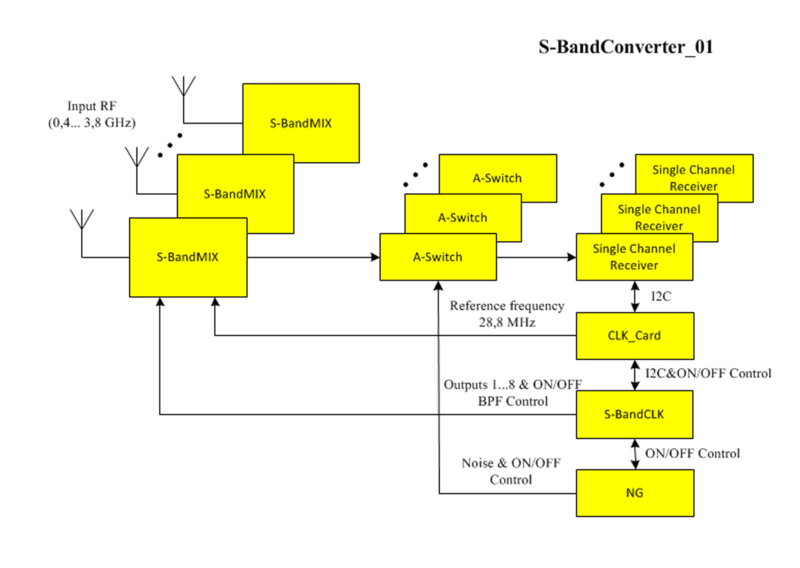 reliable shielding and separation circuits of the antenna – upconverter – SDR-Receiver- computer. Otherwise there is the undesired modulation of the upconverter’s heterodyne with signals of neighbouring high-power FM stations, because their frequencies are often used close to heterodyne upconverters (e.g., 100 MHz). Moreover, there are interferences from the fluorescent lighting. Conventional methods of suppression these effects: usage of balanced transformers, utilization of the tunable preselector input, installation of the upconverter few meters from the SDR receiver and computer. the upconverter must not affect to the sensitivity of the SDR receiver. This is especially relevant for passive upconverters, which transfer ratio often less than minus 6dB, what leads to reduction of the sensitivity to receive weak signals. HF_CARD is designed for the receiving of terrestrial signals ELF, LF, MF and short waves (< 30 MHz) using the RTL-SDR v.3. The usage of the other single channel receivers is possible. using of the high-level switching RF mixer matched the input impedance R=50 Om for RF signals and for switching signals 2Ftuner. support of the internal (TCXO 27.0MHz, 2.5ppm) and external (10 MHz or 28.8 MHz) clock generators. The configuration is carried out using I2C bus. I/Q signals output with the software configuration (I2C) of the IF values. For example, it is possible to set the IF=12 kHz and connect the receiver to the external sound card so that the software SDR receivers, e.g. DREAM, SoDiRa etc., can be used. Two phase shifter ϕ=90º for the IF=3.57MHz. That leads in the resulted SSB signals with a spectrum suppression of one sideband. The RF signal with IF=3.57 MHz is connected via SMA-SMA coaxial cable with the antenna input of the RTL-SDR. The RTL-SDR (RTL2832U) has to be configured to receive the Q input. HF Card is designed in the same form factor as other cards and is connected direct to the Single Channel Receiver (or RTL-SDR Dongle). FRA_CARD is designed to connect a ferrite or a loop antenna to the HF_CARD and has a differential-to-single-ended amplifier with extremely high CMRR (common-mode rejection ratio) at high frequency. 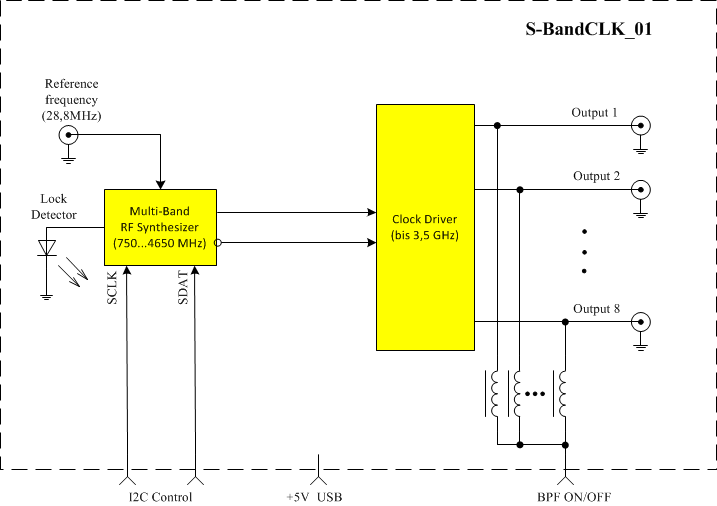 Single S-Band oscillator that is distributed among all receivers.